Techniblock is a non-greasy, non-sticky, very water resistant and light-weight sun protection spray that dries instantly on the skin to provide an invisible barrier against harmful UV rays. Protection is delivered in a cooling, continuous, clear aerosol spray that works upside down and provides quick, simple and effortless all over application that starts protecting skin instantly. It contains anti-oxidants to enhance the skin's natural defences in the fight against the damaging and ageing effects of UV exposure and has an equivalent Boots 5* rating. Fragrance-free and breathable, Techniblock does not contain oils and emulsifiers like many other sun creams and lotions; therefore, it will not block pores or irritate even the most sensitive skin, significantly reducing or even eradicating the symptoms of skin rash and prickly heat. This also makes Techniblock extremely resistant to water so you can be assured that it will keep you sunburn-free while swimming. 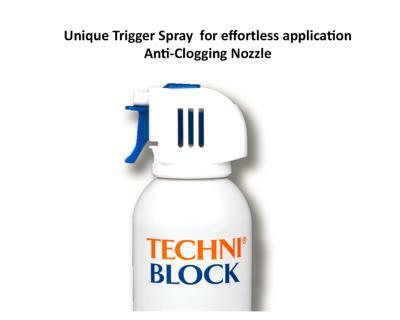 Techniblock, like other aerosol products, has no expiry date. It is packaged in a sealed and pressurised airtight container and even once the can is opened, Techniblock's unique formula remains fully effective, so there's no need to discard half-used cans so it's great value for money, and the anti-leak nozzle won't clog with product or leave a mess in the bottom of your bag. Developed and manufactured in a world-class pharmaceutical laboratory in South Africa, where they certainly know a thing or two about the sun, Techniblock is a tried and trusted brand that's been protecting skin for over 10 years. It's EU compliant and endorsed by CANSA, the South African Cancer Association. Easily the best sunscreen on the market, Techniblock is recommended by the RYA (Royal Yachting Association) and is the number one choice for golfers. An ideal and effective sunscreen for active people who like to enjoy the sun. Totally works and worth the money. Great protection easy to apply. Easy to apply, non greasy and excellent results. Really easy to apply. Non greasy, you dont even know you have sunscreen on and its lasts for hours. I am very sensitive to the sun, and this product has never failed to perform!! Excellent product especially for sun related skin conditions. Used for over 5 years for many holidays in high tropical temps. Never burned - great all over protection - worth the cost! Very easy to use and good protection. This is so good and I wouldn't use anything else now I never burn and so easy to apply. Brilliant stuff, does exactly what is says on the tin. We also have the SPF40.